Operation Joypad is the name for York’s biggest ever crime prevention campaign whereby North Yorkshire police checked 21,004 houses between May and July to see how many people were properly securing their property. Both physical and visual checks were made to see whether people were locking doors and shutting windows. See the story here. 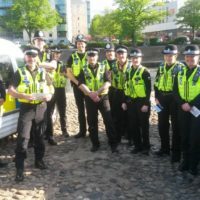 Operation Joypad involved dozens of police officers, PCSOs, Special Constables, cadets and volunteers over the 3 month period; timed because insecure burglaries tend to increase over the summer months as people often open windows and doors and spend more time in their gardens in warm weather. The good news is that the message must be getting through as over 90% of the homes checked were indeed secure with only 1,808, or 8.6%, houses found to be insecure. Inspector Lee Pointon of York Police said that they found that the number of secured properties increased as the campaign went on, suggesting that the message was getting through. Another benefit of such a high profile campaign is that would-be burglars would also be aware of it and be deterred from even trying. The idea was to make York a ‘no-go area’ for sneak-in thieves. It remains to be seen whether this pushed the problem into other areas. Autumn and winter bring their own security issues so hopefully residents will continue to be security conscious and their homes remain safe from opportunistic burglars. previous Our own worst enemy? next Could you face your burglar?